Strangely, I don't remember this film perturbing any of us much at all. I think it seemed too much like fiction. I'm looking at it again now because I've just finished reading the Doomsday Men by P.D. Smith, and now, because of this book, I see it with an increased awareness. There are descriptions in the book about what happened in Hiroshima that resonate and then horrify: the initial flash that fries eyes and removes skin, and then shock wave and the firestorm before the fall out. 'Fall out' was a term I've thought about a lot but the concept of a 'firestorm' is new to me. I'd heard the word, but now that I've read the Doomsday Men I know what it really means to those unfortunate enough to be caught sheltering in a confined space like a cellar in the midst of a conflagration. The oxygen was catastrophically replaced by gases like carbon monoxide and methane and so tens of thousands of people died in firestorms caused by incendiary attack in Hamburg, Dresden and Tokyo. After reading that I thought of the time I went to Hamburg and spoke to people there. Some of them were old enough to remember. I wonder now how we could look at each other in the eye. when reflecting the reaction of society, because this is what most people read; and from that we can guess that the concept of a man-made doomsday seemed to be preoccupying everyone. These two aspects of the book are married together very neatly by the question who were the real Doomsday Men (as typified by Peter Sellers' depiction of Dr Strangelove in Kubrick's masterpiece) - as well as a repeating motif, it makes an excellent narrative hook. I suppose the story of the Doomsday Men has been a constant background to my life. Most of the time I have successfully pushed it to the back of my mind because it seemed too frightening and too impossible to be true. But reading the Doomsday Men has forced me to confront it and understand. Recently the threat of weapons of mass destruction has been overshadowed by natural plagues, global warming and economic crisis, but it is still there. It can still happen. And in the Doomsday Men there is a gripping account of when, in 1962, it nearly did. I was too young to be aware of the Cuban crisis but after reading about this story I remember another time, slightly later, when there was something on the car radio and my parents discussed it in worried tones. I think they thought that I hadn't heard them, but I had. We were on our way to a big department store in the middle of Leicester. It was the most solid and dependable thing in my world. Then, soon after we got there, I found myself alone. It was not the unexpected isolation that worried me, but the realisation that the floor was shaking. Something was coming and no one could stop it. I stood still and looked around me. All this could go. The walls could fall away and it would be as though none of us had ever existed. Even this huge edifice to mammon could be vapourised - and not by an act of God, but by a human finger touching a button. For those few paralyzing seconds, before I realised that the shaking signified little more than heavy machinery, I appreciated the fragility of us all, and how dependent we are on the sanity of a few others. Even though the world has changed a lot since then we are still dependent on such restraint. 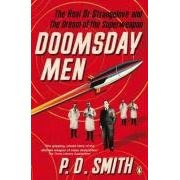 It took me close to a week to read the Doomsday Men but I am glad that I did (and glad too that I came across its author, Peter Smith, through the web - we now share an agent). It is a tremendously rich and rewarding book, a magnificent accomplishment - and, I think, an important one. Great review! Recalling the anxiety of the late Cold War era, we had a minor earthquake in the middle of the night in my neighborhood where I grew up (which turned out to be near a trivial fault line that runs under a stream). The boom sound woke me up, and I remember thinking "this could be it." I feel relieved to learn it was just a natural phenomenon (and it did absolutely no damage by the way; it was just scary). Meant to write "felt relieved" in the previous message as it pertained to my childhood, not recently. Ah, you too! I wonder if everyone that lived during the cold war has moments like this. Sometimes I wonder why we're not more psychologically damaged. I suppose there's some mechanism in our brains that makes our thoughts turn away onto something else for our own protection. I lived in several areas near major US military bases, knowing that if THE day came, we would eaither be gone quickly from a strike or from massive doses of radiation. I can recall devouring all of the information published in Jane's and wondering if NATO could stop the "Red Menace". Yes Jud, looking at that film instant annihilation certainly seemed the best outcome - one I would choose every time. A very disturbing film indeed. I have a vague memory of seeing it or something like it back in the 1960s. Despite nuclear disarmament,the threat is still there. Like Jud, I would prefer to be vaporised instantly. Interesting about fire storms... The recent fires here in Victoria over summer, were described in terms of a nuclear attack. There were fire storms that destroyed whole towns in a few minutes. The Doomsday Men sounds very interesting and your review makes me want to log onto Amazon instantly and order it. Thanks for that Clare. Thought-provoking indeed. You're right in that other things have taken our minds off it - but it could still happen ... North Korea comes to mind. I think I saw an article in a Sunday Supplement about that now you've mentioned it, Anne. Yes a street of houses and the grim catalogue of deaths. It is hard to imagine not being able to escape from a fire - hard that it should get so bad so suddenly without you being able to do something - but obviously it does. And now I've seen this film and read about it in this book I think I can imagine it more. I do recommend the book. It took me quite a long time to read it because there is so much there - but definitely worth it. Yes, Kay, just thinking about Korea in terms of this is very worrying. Lived in London edited by Emily Cole. China Part 3: Towards a provisional itinerary.